II Maestro Wood Fire Pizza uses their own specialised couriers to deliver their food. With chips, rocket and aioli. Filled with porcini mushroom and taleggio cheese with a rocket salad. All have tomato and mozzarella base. Available in Medium - 11 inches, and Large - 13 inches. 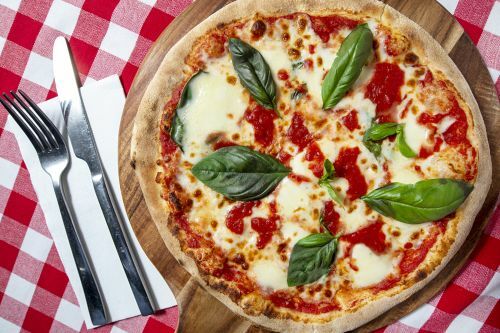 Fior di latte and fresh basil. Capsicum, hot salami, jalapeno, red onion, garlic and oregano. Virginia ham, mushroom and black olives. Mushrooms, red onion, charred red capsicum and olives. Chicken breast pieces, barbeque sauce. Mushrooms, salami, olives, charred capsicum. Hot salami, ham, mushrooms, red onion, charred red capsicum, olives and pineapple. Virginia ham, hot salami, bacon and BBQ sauce. All have tomato and mozzarella base. Available in Medium - 11 inches, and Large - 13 inches. - No half / half. Pancetta, red onion, chilli and gorgonzola cheese. Pancetta, fresh chilli, mushrooms and charred red capsicum. Smoked eggplant, charred red peppers, fresh basil and provolone cheese. House made pork and beef meatballs topped with parmesan. Roasted pumpkin, zucchini, artichoke and goat’s cheese. Charred red capsicum, pesto, goat's cheese and prosciutto. Slow-cooked lamb, red onion, truss tomatoes and goat’s cheese. Italian sausage, caramelised onion, fresh tomatoes and provolone cheese. Hot salami, artichoke, charred red capsicum and buffalo mozzarella. Shaved prosciutto, fresh rocket, parmesan and balsamic glaze. Chicken breast, pancetta, spinach and gorgonzola cheese. Virginia ham, pancetta, hot salami, Italian sausage with sweet and sour caramelised onion. House smoked salmon, red onion capers, finished with dill yoghurt dressing. Mussels, clams, white fish, calamari and prawns. Tiger prawns, salsa verde, truss tomatoes and fresh mozzarella cheese. Our home style beef and veal ragù sauce. Sautéed pancetta, cream, egg and parmesan cheese. Pancetta, charred red capsicum, onion and chilli in homemade napoli sauce. Traditional home cooked tomato and basil sauce. Homemade meat lasagna topped with our house made Bolognese and Italian parmesan. Mixed seafood cooked in fresh garlic and tomato sauce. Spinach and ricotta ravioli in a creamy roasted pumpkin sauce. Chicken, creamy pesto, semi-dried tomatoes and parmesan cheese. House smoked salmon with creamy rosé sauce and spinach. Cream, napoli, mushroom, semi-dried tomato, spinich and olives. Mushroom, onion, capsicum, spinach and semi-dried tomatoes. Tiger prawns, salsa verde and semi dried tomato. Truss tomatoes, buffalo mozzarella, fresh basil dressed with flaked sea salt and extra virgin olive oil. Mixed leaves, truss tomatoes, olives, cucumber dressed with a white balsamic dressing. Tomato, goat's cheese, cucumber, red onion, olives, extra virgin olive oil, oregano. Tea and coffee full range of soft drinks.